Chief town of the arrondissement of the department of Eure-et-Loire, France. From the twelfth century, Jews were living in this locality, where they were considered the property of the Countess of Dreux. In accordance with a convention concluded between King Louis and the barons at Melun in 1230, the Jews could be brought back to their old homes by force in case they had emigrated. This happened in 1234, when Louis ordered Thibaud. Count of Champagne, to restore to the Countess of Dreux the Jews that he held unlawfully, and the ownership of whom would be for her a source of revenue. 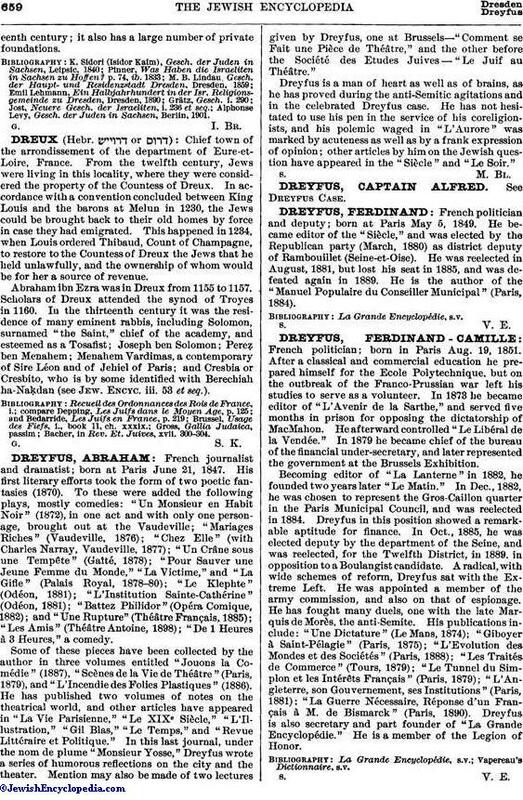 Abraham ibn Ezra was in Dreux from 1155 to 1157. Scholars of Dreux attended the synod of Troyes in 1160. In the thirteenth century it was the residence of many eminent rabbis, including Solomon, surnamed "the Saint," chief of the academy, and esteemed as a Tosafist; Joseph ben Solomon; Pereẓ ben Menahem; Menahem Vardimas, a contemporary of Sire Léon and of Jehiel of Paris; and Cresbia or Cresbito, who is by some identified with Berechiah ha-Naḳdan (see Jew. Encyc. iii. 53 et seq.). Bacher, in Rev. Et. Juives, xvii. 300-304.